We feature the largest international hairwear collection. We offer wigs, hair pieces, add-ons and our custom made-to-order european hair. There's always a Jacquelyn designed with your needs in mind. 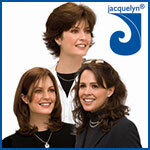 When it comes to excellence in hairwear, you can rely on the jacquelyn signature. Get more for your wedding! Don't forget to mention ChossonKallah.com when visiting Jacquelyn Wigs.